Our Limousine Service will make your trip to the Oktoberfest, the biggest beer festival in the world, an unforgettable experience. In addition to our first class Limousine Service, we at Limousine Service “Bavaria Limousines” offer you an outstanding shuttle service and chauffeur service. What does that mean to you? You arrive in Munich, by train or plane and we are there waiting for you with our shuttle service. You just get in our comfortably equipped business minibuses and enjoy your relaxing journey to the hotel. After you have had a rest and freshened up ready for the Oktoberfest, we´ll pick you up at your hotel and take you to the festival grounds. You don´t need a map, you don´t need to hire a car, there´s no need for you to travel with your own car at all and you don´t need to waste time thinking about where to park or how to get back to your hotel if you´ve had a few drinks, because your Oktoberfest Limousine Service will pick you up again after the fun and take you safely, quickly and comfortably back to your hotel. If you wish, our Shuttle Service can accompany you for the duration of your visit. Indeed, our Limousine/Sedan Service offers you an outstanding chauffeur service. Our chauffeurs are trained to an extremely high standard, know the area very well are extremely well mannered and have a good knowledge of foreign languages. 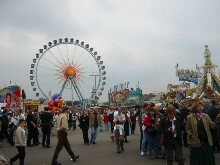 Therefore, as a visitor to the Oktoberfest, you don´t necessarily need to be able to speak German. Our chauffeurs are well qualified to act as interpreters for you. Our Chauffeur Service will also collect you directly from the airport or station and take you to your hotel where you can freshen up and relax a little after your journey. Afterwards you simply tell your chauffeur where you would like to go and he´ll take you there. As already mentioned, the Oktoberfest in Munich is the biggest beer festival in the world and is visited by about 6 million people each year. The Munich breweries brew a special beer for the celebrations on the “Wiesn”, containing more wort and therefore also a higher alcohol content. So it´s a good idea, after a day at the Wiesn, not to have to drive back to your hotel yourself, but to let our chauffeurs do the job for you. Today, in addition to German visitors, more and more visitors are coming from abroad, for example from Italy, USA, Japan and Australia. In most cases they don´t know their way about. Our Limousine Service “Bavaria Limousines” will gladly arrange airport transfers, hotel reservations and, of course, if desired, restaurant reservations, too. In addition our Shuttle Service can take you comfortably to the beer festival, or any other destination of your choice. Today, the official start of the Oktoberfest is the brewers´procession to the festival. Led by the “Münchner Kindl” (the mascot of Munich) and the current Lord Mayor of Munich, the splendidly decorated brewery horses and carriages and the fairground entertainers´floats make their way into the festival grounds. They are accompanied by the music bands who play in the beer tents. At exactly 12 o´clock the Lord Mayor taps the first barrel in the Schottenhamel Beer Tent and the beer festival is officially opened. Don´t miss this unforgettable experience. Let one of our chauffeurs take you safely and quickly to the procession and pick you up again when you have finished celebrating. Another highlight of the Oktoberfest is the annual traditional costume procession. It is one of the biggest processions of its kind in the world and is also led by the Münchner Kindl. This procession stretches over a 7 kilometer distance from the Maximilianeum to the festival grounds and is held on the first Sunday of the festival. Your Oktoberfest Limousine Service would be delighted to take you to this unique experience in one of our vehicles. Furthermore, at the Oktoberfest you will find numerous beer tents as well as fairground rides and fairground entertainers. You really should consider staying a few days here at the Oktoberfest, to at least have the chance to look inside each tent. Apart from our Chauffeur Service and Shuttle Service, our Limousine Service also gives you the opportunity of having us at your side as advisors. Our chauffeurs can then naturally advise you which tents are really worth a visit. For example, the Champagner Bar in the Hippodrome is particularly popular with young people. The “flirt” factor in this tent is one of the best in the whole festival. Many celebrities also show up here, so perhaps you´ll be lucky enough to get the odd autograph or two. This beer tent also offers exceptional Bavarian specialities. So it´s a place worth visiting. In the Hofbräu Beer Tent you will find enthusiastic visitors, who, from 12 o´clock onwards are swaying back and fore to the music and lifting their beer Maß (a litre of beer). Here you will find visitors from all over the world from as far away as the USA and Australia. A little tip – at lunchtime, the Bavarian delicacies and other specialities are good value for money here. 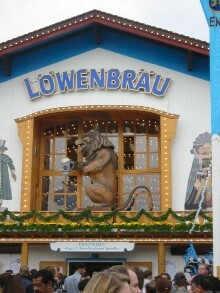 What could be more inviting than a traditional beer from a Munich brewery with a hearty Bavarian speciality as well. The Schützenzelt is mostly already full at lunchtime. If you want to get hold of a seat in here, you should get here early in the morning. At lunchtime you can then enjoy a jovial festival meal with suckling pig Bavarian style in malt beer sauce with Krautsalat (white cabbage salad). On this note our Limousine Service “Bavaria Limousines” wish you a wonderful and exciting time at the Oktoberfest. We would be delighted to hear from you if you need a car/sedan and chauffeur or a minibus, so that you and your friends can enjoy the experience together.